Jess would never have looked twice at Nicu if her friends hadn't left her in the lurch. Nicu is all big eyes and ill fitting clothes, eager as a puppy, even when they're picking up litter in the park for community service. He's so not her type. Appearances matter to Jess. She's got a lot to hide. Nicu thinks Jess is beautiful. His dad brought Nicu and his mum here for a better life, but now all they talk about is going back home to find Nicu a wife. The last thing Nicu wants is to get married. He wants to get educated, do better, stay here in England. But his dad's fists are the most powerful force in Nicu's life, and in the end, he'll have to do what his dad wants. As Nicu and Jess get closer, their secrets come to the surface like bruises. The only safe place they have is with each other. But they can't be together, forever, and stay safe, can they? Jessica is a tormented teen. Living with her mother and step father in a violent home environment, Jessica has been sentenced to participate in a Reparation Scheme, her third offense landing her in police custody after a shoplifting incident. Jessica's behaviour is a reflection on her fragile mother, beaten and abused by a man who is dominant and malicious. Nicu is living in England temporarily, his father having migrated from Romania to England in order to earn money as a dowry to obtain Nicu a wife. Fifteen year old Nicu labors for his father but when he's caught thieving and sentenced to the Reparation Scheme, he's forced to enroll in school. Through the Reparation Scheme, Jessica and Nicu begin a tentative friendship. A language barrier. An unlikely connection and two teens finding solace in one another. Jessica is a character who has endured torment and abuse, her stepfather a domineering and violent man. Although I've also experienced domestic violence as a child, I couldn't relate to Jessica and her often merciless attitude. Having committed her third offense and Nicu caught thieving, the two teens are both sentenced to the Reparation Program, an initiative to rehabilitate adolescents rather than facing prison. Nicu's narrative was captivating. Having migrated with his parents to the United Kingdom, Nicu and his father are self employed in order to earn an adequate dowry to obtain a wife home in Romania. Although his parents are insistent, Nicu refuses to marry and wants to begin his life in the United Kingdom rather than return home. Nicu is absolutely endearing. His character explored the social injustice of racism and race profiling. It was interesting to see the comparison between both parents, Jessica had been arrested due to her third offense and they were treated with respect. Although it was insinuated that her behavior was a result of defective parenting. I appreciate narratives told in verse, with so few words authors are able to captivate readers and Sarah Crossan is a wonderful storyteller who breathes life into her characters. We Come Apart touches on social issues such as domestic violence, racial profiling and racism. Nicu wants to be accepted and I felt Jessica had taken advantage of his affection, often choosing the cruelty of her unreliable friends and choosing not to asset herself and defend Nicu against their racist remarks. I'm fascinated by stories of immigration and seeking asylum, which is the foundation for many Australians in particular. We Come Apart touches on those same foundations and as Nicu explores thoughts of his new surroundings and learning a new language, I'm dubious as to the validity of the representation. We Come Apart is a touching exploration of friendship and transcending barriers of language and stereotypes. Although I became increasingly frustrated with Jessica's character, the narrative was captivating, immersive and representative of our broken societies. I think that even if characters are unlikeable they need to be relatable on some level. But despite Jessica it sounds like this author has hit all the right notes in this narrative, which given the topic I'm so pleased about. We need narratives like this. My dislike for Jessica was mainly due to how she treated Nicu, having preconceived notions about who he was and allowed her friends to influence her option. It really highlighted a group mentality and explored peer pressure as a teen. Through her interactions with Nicu, I begun to like her character more. It was a testament to Nicu though, how patient he was. Ah, I see. Makes me more curious about how the author shows this in verse. We're Nicu and Jessica the only two POVs in it? Hmm .. Jessica sounds like a character I might be able to relate to. It sounds like a good book, and relevant. She becomes more likable throughout the book. I found Nicu much more interesting and had hoped to learn more about his migration and history. Jessica sounds like a piece of work, to be honest, but I find that lately that's exactly the kind of heroine that works for me. I am very intrigued by Niru's story as well. It sounds like it's heartbreaking and hopeful at the same time. I've read Crossan's dystopia series and I remember really liking it, so I'll give this one a shot if I can find it at the library. Thanks Nick. She is, until she starts to break from her peers and their prejudice. It's an amazing story of self realisation. I would love to see what you think of it. Both characters sound really fascinating to me. They truly are Karen, a wonderful story of friendship. Same! I felt as though it let the narrative down. It was abrupt and too opened ended given the nature of the storyline. I needed closure. Oh, I didn't realize this was told in verse. I do like those books! It's a skill I wish I had. This sounds like a well done book overall, but sorry Jessica was difficult to like. I really enjoy verse books too Lauren, they can make such an impact on readers with so few words. I always feel like we're getting the short end of the stick when it comes to contemporary fiction. You guys get the best! And even though you didn't enjoy this as expected, I still am curious about these characters. Difficult ones are the best ones to get to know, so yeah. Come at me, Jen! LOL. It should be coming out in the US I think Joy as it's a UK release. It's a great read although Jessica isn't all that likable, her character does develop. I enjoyed it overall though. It truly was Ailyn and told in verse. It'a a wonderful read, I'd love to see what you think of it. I've read mixed things about this book! It does sound like it's worth putting up with the MEH stuff to get to know Nicu and I really do love reading about places I know nothing about, it'd probably have me googling Romania. Actually your review has me wanting to go google Romania and arranged marriages. I think Nicu's narrative was far more engaging and I wanted to learn more about his history. Although it alternated in points of view, it felt as though the main focus was on Jessica unfortunately. I think it's been a bit of a hit and miss for a few readers. Could also be the verse aspect. I'd love to see what you think of it. Nicu's character and situation sounds really interesting. I'd like to know more but I've never read a book in verse before, and my past experiences with poetry in school weren't amazing. I never really figured out how to read poetry. 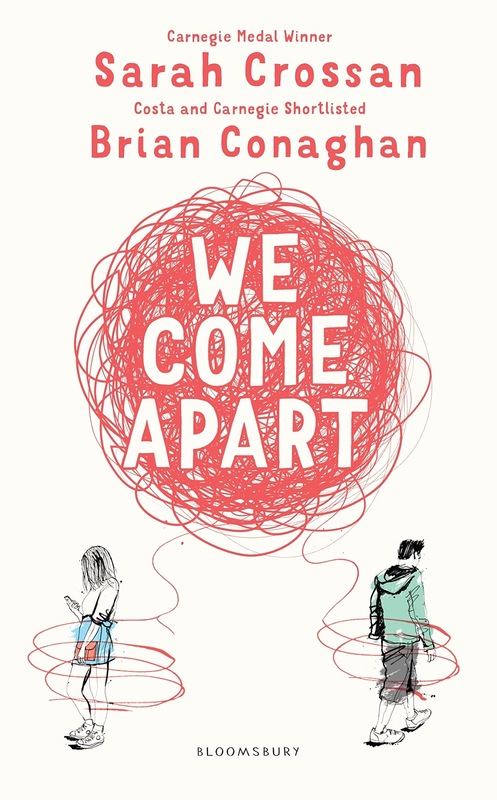 They can take some getting used to but We Come Apart is an easy read. I think you'll really enjoy it. This sounds like an interesting and potentially very educating book. While I agree that imperfect characters can make a book unpleasant to read, I personally like it better that way. The flaws make them more "real" to me. It's more so her prejudice that makes her unlikable in the beginning. Jessica allows herself to be swayed by a group of ignorant friends. But throughout her narration she begins to grow and learn, the ending was disappointing though. This sounds like a really interesting read, especially with the difference in attitudes towards Jessica and Nicu considering Nicu is Romanian as I knew what the common attitude to Romanians are here in the UK. I'd be interested to read a book addressing that if nothing else. I will have to keep my eyes open for it. Living in the UK, I'd love to see what you think of it Becky. It really is a great read and point of discussion.